National Trucking Week is over for another year, and the profile of the trucking industry was raised considerably. With all that extra attention, you might have grown a greater awareness for the commercial vehicles that travel our roads every day. You probably saw a lot of trucks and trailers, but did you happen to see an LCV? An LCV is transportation talk for a long-combination vehicle. Basically, it’s a truck that pulls two (or more) trailers instead of one. Hauling more than one trailer has significant advantages. More room to carry things means you can deliver more in one trip, which lowers shipping costs and reduces the amount of fuel used. And with less fuel being burned up, these vehicles provide environmental benefits by lowering greenhouse gas emissions. 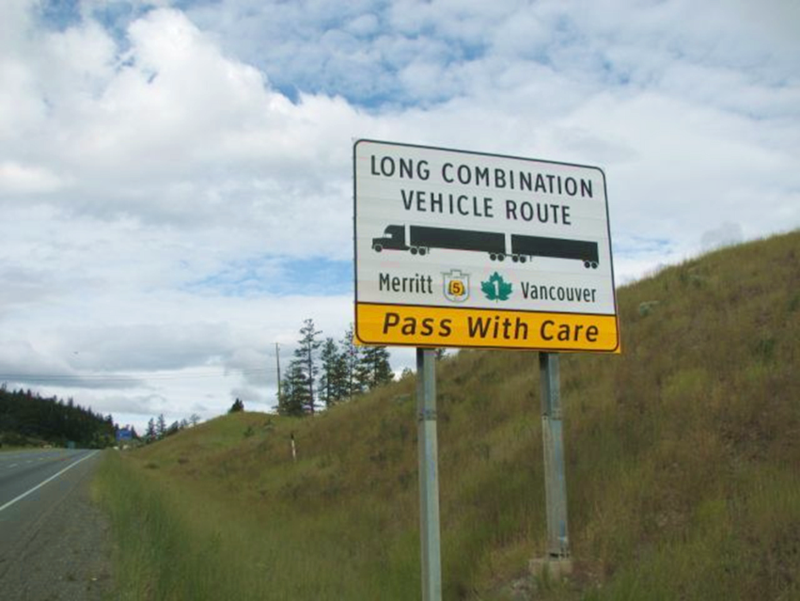 Interestingly, long-combination vehicles also have a great safety record, with fewer collisions reported than single-trailer trucks. So why not just use multiple trailers all the time? Well, added trailers make for extra weight, so they’re best used for relatively light loads. They’re also more difficult to drive than a single-trailer load, so extra driving training is needed. Even with that extra training, it’s not always feasible to use long-combination vehicles if the roads are too narrow or the turns are too tight. If you want to see one of these truck in action, your best bet is to stick to the major highways that have been designated long-combination vehicle routes, like Highways 1, 2, 5 or 97. If you do drive these roads, you’ll see signs like the one above, letting you know you’re on a LCV route. And if you see one of these long trucks, please pass with care! 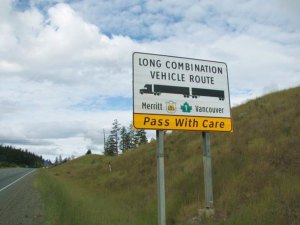 If you’d like to find out more about long-combination vehicles, you can check out our Commercial Vehicle Safety and Enforcement web page.